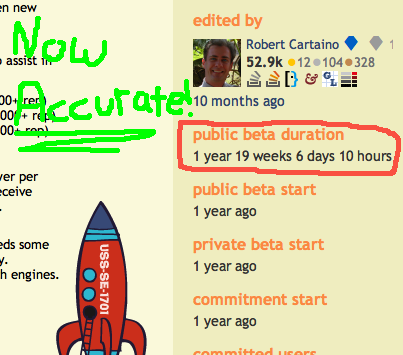 This script was created to address this Meta question: When viewing the Area 51 proposal for any site, this script adds a "public beta duration" block showing the length of the public beta. Google Chrome / Greasemonkey / any other browser supporting Userscripts. This was created by Josh's Socks, he can be contacted at socks -at- josh -dot- gitlin -dot- name, or via my website. To be honest I'll never need this but it uses jQuery so it must be awesome. Good Job! Not the answer you're looking for? Browse other questions tagged script area51 .